Talk about lucky. Around 4:00 yesterday afternoon I felt the urge for a walk in the desert so I went out to my favorite spot, the Desert Botanical Garden. I walked around until about 5:45 and as I was leaving I noticed that the new restaurant was all lit up so I asked someone at the gate what was happening. He told me it was opening night for the brand new restaurant called Gertrude's. So I thought what the heck, I should give it a try. I'm so glad I did. Since I was by myself, I sat at the bar and proceeded to get the royal treatment. The bartender Roberto gave me excellent service, explaining everything and offering me tastes of specialty drinks he was preparing. 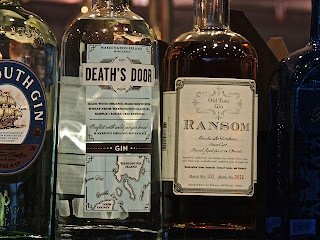 The general manager John offered me a whiff and sip of the Ransom gin you see to the left. It was not like any gin I'd ever tasted before. 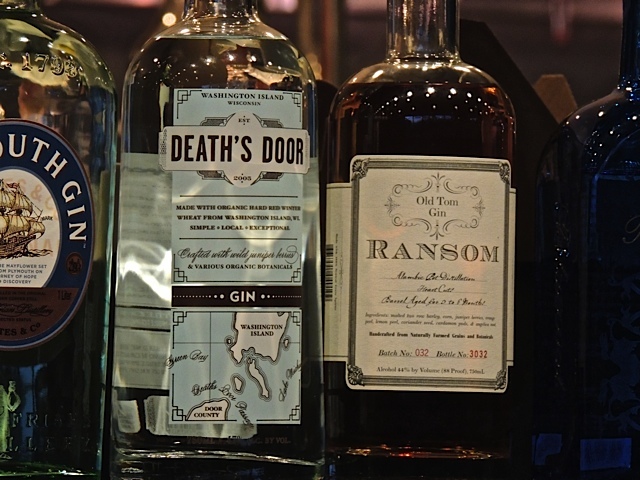 It's a historically accurate revival of the predominant gin in fashion in the 1800's. But, I didn't just drink, I had the basil risotto with pesto and mushrooms and the lemon cheesecake with a crust of mesquite and a blueberry compote. 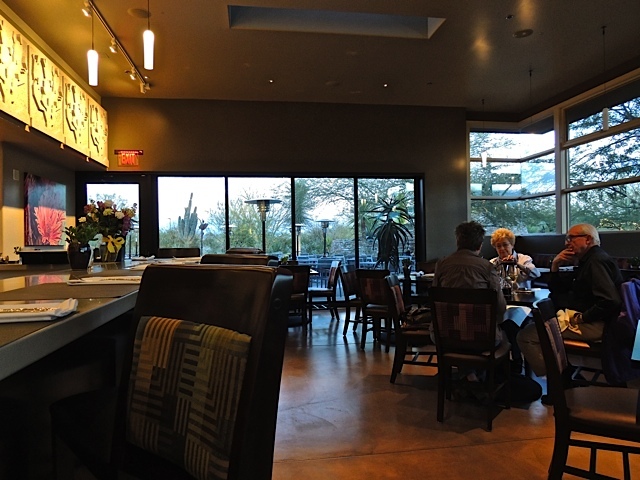 By the way, Gertrude's is named after the very first President (1936) of the Board of Directors of the Arizona Cactus and Native Flora Society, the forerunner to the Desert Botanical Garden. Lucky indeed, sounds like you had a great time in a fantastic looking place. I wish them every success! We will look forward to trying out the restaurant. You really were given a right royal welcome Sharon, nice one..had to laugh at the 'Deaths Door' gin, I'm guessing that you didn't try that one!! That sounds nice. Don't drink the Death's Door though. Definitely a place that is worth a visit. Wow, I was just on DBG site reading about the new restaurant. Can't wait to go. Was wondering about the name, Gertrude's, and now I know. Boy - did you ever luck out! Sounds fabulous. What luck! What a find. We shall visit there soon. It is an attractive restaurant. Good to hear that the service and the food match the fine decor. Bon appetite. Sounds like a tasteful menu! After all those samples at the bar, I'm happy to know that you made it home all right. Gertrude's is a restaurant project that I hold near and dear. I am so glad you had a fabulous experience. It looks like a very nice place and I love the bottles shot.